Search and adopt a Irish Wolfhound near you. 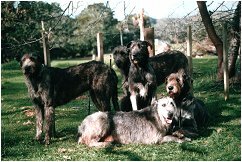 The Irish wolfhound was originally a war dog, used to drag men out of chariots or off horseback, but was also used as a hunting hound and as a guard. There are numerous references in Irish mythology to its prowess in all these fields. It was used to hunt the Irish elk and the wolf and was used singly or in pairs rather than in a pack, hence the need for great size.